One of the things I really wanted to do while in Thailand was take a cooking class. My boyfriend and I love Thai food (or what we thought was Thai food before we actually went to Thailand), so we figured learning how to make the dishes we enjoyed would be a good idea. And it was. Spring rolls and papaya salad! We decided to make a stop in Krabi Town on the way to Khao Sok National Park, but our one night stay turned into three (what can I say, we liked the town). I happened to notice a brochure at our guesthouse for a cooking school and figured we could put our extra couple of days to good use. The school was Smart Cook Thai Cookery School and they offered a great afternoon of cooking (and lots of eating). After getting picked up from our guesthouse (included in the price of the class) we hit a local market to buy supplies and learn about some of the major flavours in Thai cooking. We were taken around the market by our teacher, Bunnie (who was as adorable as her name), where she showed us all of the ingredients we would be using. We were then given an hour to wander before meeting back up to head to the school. Other than the "meat" room, which was not the best spot for a vegetarian, the market was colourful, lively and a great start to an afternoon of cooking. We chose the Daily Course + Market Tour (1500 bhat), which meant choosing seven dishes. 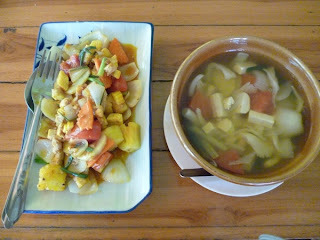 I chose spring rolls, coconut milk soup, papaya salad, red curry paste, tofu with curry and sticky rice with mango. My boyfriend went with the same, other than hot and sour soup and sweet and sour veggies. Anything with meat can be made with tofu, which was a bonus for us. There was only three of us in the class so Bunnie could easily make the rounds and help, and we all had a great view of when she was showing us something. We started with soup and salad, then onto spring rolls, curry paste, curry tofu and then dessert. I was insanely full afterwards, as you can imagine. 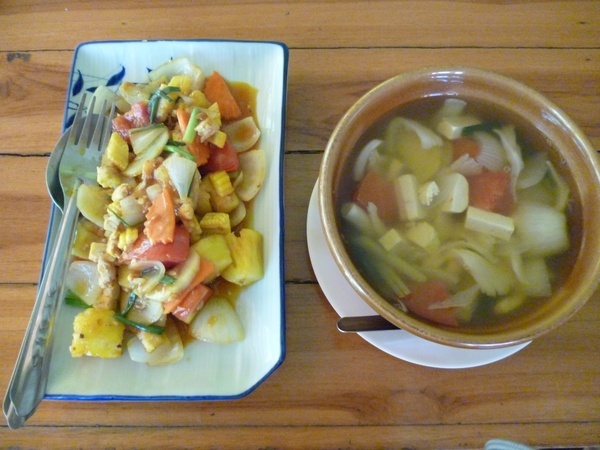 The food was easier to make than I thought, but since Thai cooking is done so quickly at such high heat, as long as you have all of your ingredients on hand and prepared, getting it right is doable for most cooking levels. We were given a cookbook at the end of class, which I can honestly say I've used a lot since being back. 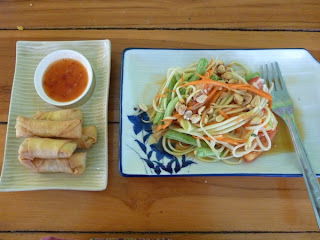 My favourite things to make are spring rolls, papaya salad and coconut soup. I have yet to attempt curry paste, but it's on the list! Have you ever done a cooking class while traveling? What did you think?